As of November 15, 2017, Mega iPlus, a site that was simply started to share music with a budget of zero dollars and zero cents, no donations, no help, no support, and a horrible blogger template, reached 1 million pageviews. It WOULD NOT HAVE BEEN POSSIBLE without all of the help we've recieved. So I want to take this time to shout out EVERY SINGLE MAJOR PERSON, at least that I can remember, despite whether they work here anymore or not, who helped make this possible. First and foremost, I want to shout out the Lord God. Without Him, I would have been dead a long time ago. He helped me so much in life and with this site and for that I'm forever grateful. Some of you all may not be religious but I hope you all can respect my position. Now, secondly, a major shoutout to Diana Cole, known to most of you as Diana or Dianne Maria Louisianna. This site was her idea. She had the vision, I had the music. Unfortunately, as of February 2017, she no longer is a part of this site, but she'll always really be a part of it because without her this site wouldn't be what it is. 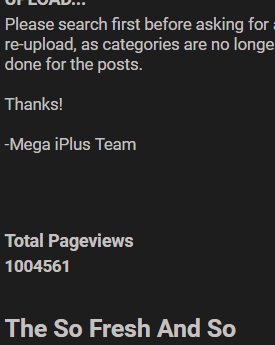 The name "Mega iPlus" was her idea. It sure sounds a hell of a lot better than my "Chi-Town Downloads". Lmfao. Now, I'm gonna go through a laundry list of people who helped me. 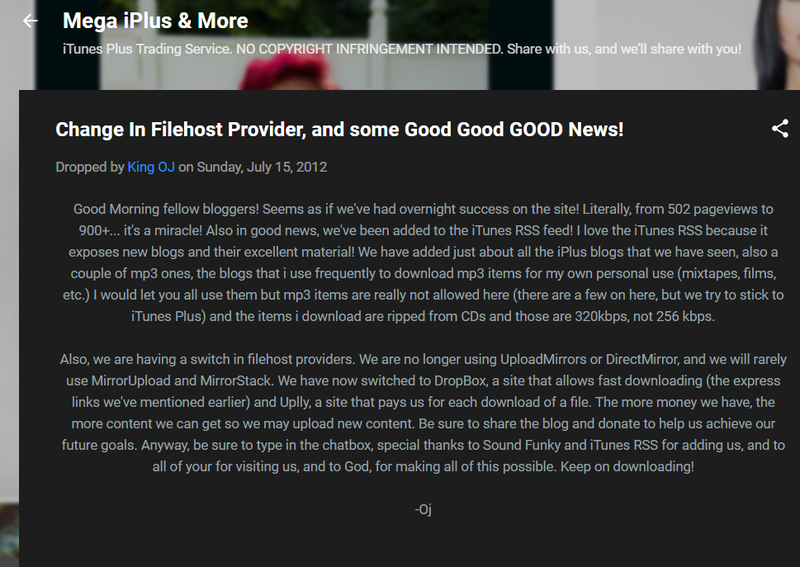 -The iTunes RSS Feed and Sound Funky for being amongst the first people to add our site. 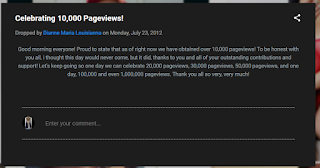 Out of nowhere, like the screenshot showed, our pageviews shot up to proportions that we STILL have not topped yet. 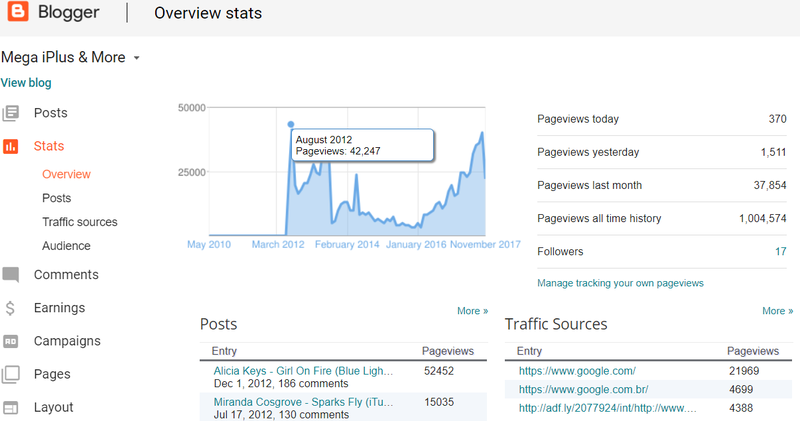 We came close last month with 40k views but in August of 2012 we had 42k, and that was just after two months of starting the site. We'd had 23k in July. 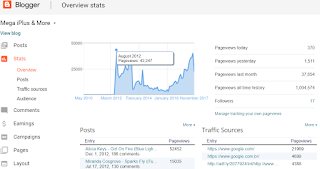 Not many blogs can say they had a 13,000% increase in views in one month, then nearly double those views the next month. They gave us the catalyst we needed to get our core fanbase, and for that, I am forever grateful. Unfortunately both sites seem to have disappeared. I can't find the iTunes RSS ANYWHERE, nnd Sound Funky (aka iSoulSounds or iTunesShuffle) has been inactive as of July 2013. RIP and thank you for what you've done for our site. Jase Muir for expanding my library rapidly with his blogs Teardrop Motel and SoulPunk. RIP to both of those. You exposed me to so much new music and even allowed me the chance to work on your site to get experience. Thanks Jase. Untouched iPlus (RIP) for allowing me to intern and for the great music. Geordie (my first employee). Disappeared from the site but he helped a lot. LastKings aka KingsPro. You may have stolen my money and abandoned the blog but you did help this site tremendously and even gave it our first custom theme. So thank you. Marcie Maxwell aka Mars. You are a wild card and I hope you come back someday. But I love you and thank you for what you've done. Jonathan Puleres, a non-employee contributor who has helped me immensely. Brittany Turner, the Queen Britt, who exposed me to a lot of new music and helped me find lots of rare R&B and Jazz records from her extensive collection. She lost her first blog but she still is live at everythingbrittany.net and is still a great friend of mine. Thanks Britt. Javier Nunez, better known as J SMOOVE. Yeah, he got a lot of his links from iPlus Collector (RIP), but nonetheless it's all done in good spirits. None of us ever claim ownership to the material anyway. J did purchase some things and made the site a lot better with his contributions. Unfortunately, his famous chatbox feud with Mars and a host of other things caused him to leave the site, but his posts are still here and appreciated. Some even are still in the weekly top ten. He's also supported my music career greatly as well. Thanks, J.
Doc Dre, a worker at One For The Stereo, one of the greatest iTunes hip hop blogs alongside Wake Up What Up (RIP). The latter is still live (wakeupwhatup.blogspot.com) but it hasn't been updated since September 2015 and all of the links are dead. It's a shame that site isn't around anymore. I used to get some great stuff off of that blog, which I think is on my old EHD (which still needs repair). At least we still have OFTS. I lost contact with Doc Dre though. We shared a lot of music with each other. Maybe we'll reconnect one day. See you in Victorville, brother. Kimarley Godfrey for sticking around and keeping the faith. Lisa McGee aka Lisa The Goddess. Words can't express how much you've helped this site. I love you and I hope you and your little girl are okay and that you return soon. Now, I must thank someone who really deserves his own post. Jelani Scott, aka Scotty, who INDUBITABLY is the core reason this site is not only still alive but has reached 1 million views. He has tirelessly updated the blog and been friendly, courteous, and respectful. And he has a great taste is music. Thanks man for everything and I'm thankful to God you found this site. If I forgot you, I'm sorry it's almost 3 am and I'm tired... leave a comment and I'll mention you. Yes, the Google Drive links (hundreds) are down now. BUT WE ARE STILL STANDING. The screenshot of our all-time viewership says it all. We started off on top, met a sharp fall, and slowly but surely began working our way back up and we are now ON TOP AGAIN and set to break our own records. WE WILL NOT BE STOPPED FROM MAKING THE WORLD A BETTER PLACE WITH MUSIC.